ABO blood group is the major blood group system in human blood typing. It is determined by the presence or absence of the two antigens, antigen A and antigen B on the surface of the red blood cells. Three alleles can be identified when determining the ABO blood group. They are IA, IB, and i. The enzymes that attach acetyl galactosamine to the surface of the red blood cells are encoded by the IA allele. The enzymes that attach Galactose to the surface of the red blood cells are encoded by the IB allele. i allele encodes an inactive enzyme. Another gene called gene H encodes for the enzymes that attach fructose to the surface of the red blood cells. The addition of fructose is essential for the subsequent addition of monosaccharides to the red blood cells surface by the IA and IB alleles. The non-functional gene H may cause the formation of masked phenotypes in A, B, and AB blood types, which resemble the O blood type. Four ABO blood group phenotypes can be identified based on the above three alleles. They are type A blood, Type B blood, type AB blood, and type O blood. The inheritance of the AB blood type follows non-Mendelian inheritance patterns. The associated anti-A and anti-B antibodies are produced in the serum by the sensitization to the environment during the first year of life. Therefore, anti-A and anti-B antibodies are IgM antibodies. The four phenotypes of the ABO blood group and their corresponding allele combinations are shown in table 1. The RH blood group system is the second major blood group system in human blood typing. It is determined by the presence or absence of the D antigen on the surface of the red blood cells. Moreover, the RH blood group consists of 49 different antigens. However, antigen D is the most significant type of antigen among those 49 antigens. The D antigen is also referred to as the ‘Rhesus factor.’ The two alleles involved in the determination of the RH blood group are allele D and allele d. The allele D is dominant over allele d. The two phenotypes produced by the above two alleles are Rh-positive and Rh-negative. The two genotypes, DD and Dd, produce Rh-positive individuals whereas the genotype dd produce Rh-negative individuals. The anti-D antibodies are present in the serum of the Rh-negative individuals. 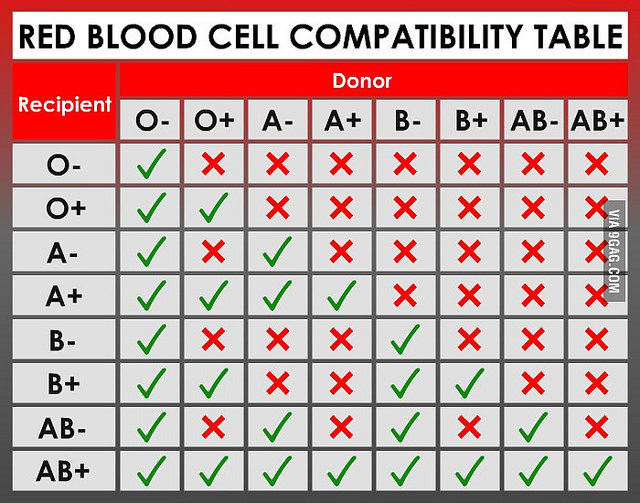 Both ABO blood group and RH blood group are collectively used in the determination of the compatibility of blood types during a blood transfusion. The frequencies of the ABO and RH blood group systems in the United States are shown in table 2. ABO blood group and RH blood group are two types of systems used for the blood typing. 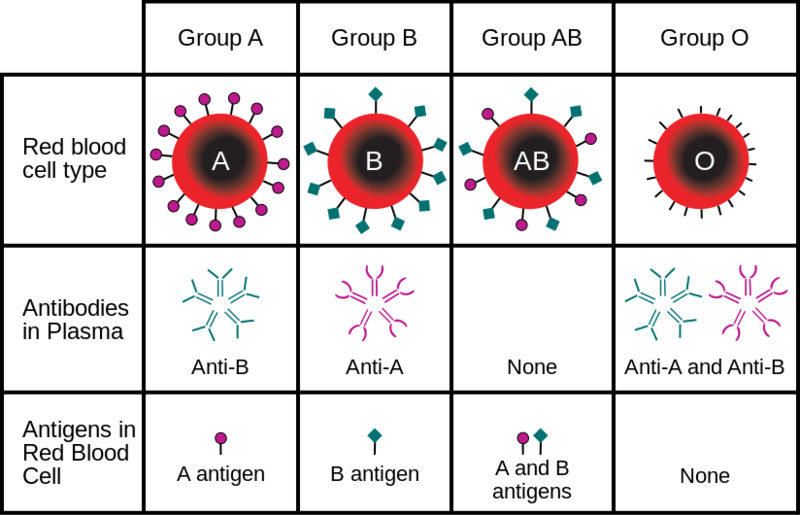 Both ABO blood group and RH blood group are determined by the presence of surface antigens on the red blood cells. 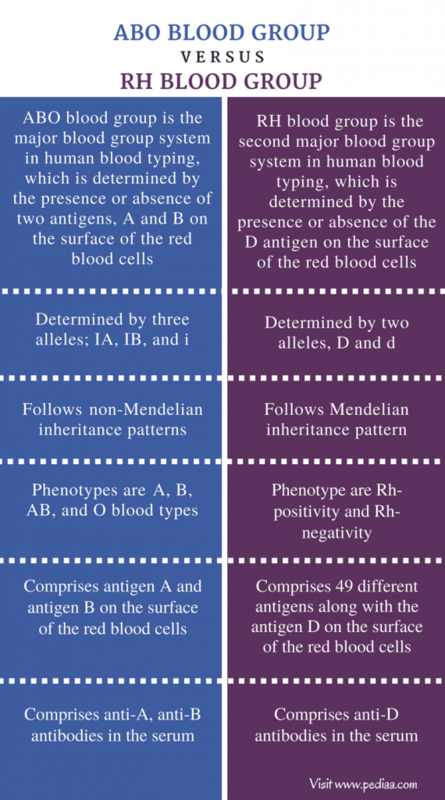 Both ABO and Rh blood group systems follow the Mendelian inheritance patterns. A combination of both ABO and RH blood groups are used in the determination of the blood type of an individual. Both ABO and Rh blood groups are cross-matched when a blood transfusion is needed. Anyone can receive O negative blood type in an absolute emergency. ABO Blood Group: The ABO blood group is the major blood group system in human blood typing, which is determined by the presence or absence of two antigens, A and B on the surface of the red blood cells. RH Blood Group: RH blood group is the second major blood group system in human blood typing, which is determined by the presence or absence of the D antigen on the surface of the red blood cells. ABO Blood Group: The ABO blood group is determined by three alleles; IA, IB, and i.
RH Blood Group: The RH blood group is determined by two alleles, D and d.
ABO Blood Group: The inheritance of the AB blood type is an example of codominance. Therefore, the inheritance of the AB blood type follows the patterns of non-Mendelian inheritance. RH Blood Group: The RH blood group follows Mendelian inheritance patterns. ABO Blood Group: The phenotypes of the ABO blood group are A, B, AB, and O blood types. RH Blood Group: The phenotype of the RH blood group are Rh-positivity and Rh-negativity. ABO Blood Group: The ABO blood group comprises antigen A and antigen B on the surface of the red blood cells. RH Blood Group: The Rh blood group comprises 49 different antigens along with the antigen D on the surface of the red blood cells. ABO Blood Group: The ABO blood group comprises anti-A, anti-B antibodies in the serum. RH Blood Group: The RH blood group comprises anti-D antibodies in the serum. ABO blood group and RH blood group are the two major blood groups used in the blood typing of humans. Both blood types are determined by the presence or absence of different antigen types on the surface of the red blood cells. The ABO blood type is determined by the presence or absence of antigen A and antigen B on the surface of the red blood cells. The RH blood group is determined by the presence or absence of antigen D on the surface of the red blood cells. In the absence of a particular antigen on the red blood cell surface, the corresponding antibody develops in the serum. The main difference between ABO blood group and RH blood group is the types of antigens that determine the type of the blood in each blood group system. 1.Dean, Laura. “The ABO blood group.” Blood Groups and Red Cell Antigens [Internet].U.S. National Library of Medicine, 01 Jan. 1970. Web. Available here. 14 Aug. 2017. 2.Dean, Laura. “The Rh blood group.” Blood Groups and Red Cell Antigens [Internet].U.S. National Library of Medicine, 01 Jan. 1970. Web. Available here. 14 Aug. 2017. 3.”ABO and Rh Blood Type Frequencies in the United States.” Human Blood: Table of ABO and Rh Blood Type Frequencies in the United States. N.p., n.d. Web. Available here. 14 Aug. 2017.